The fifth OMNeT++ Community Summit will be held at the University of Pisa in Italy from Wednesday to Friday, September 05-07, 2018. The first four Summits in Hamburg, Zurich, Brno, and Bremen were huge successes with lively discussions, keynotes, tutorials, panels, presentations, and demonstrations of ongoing and finalized research covering many aspects of OMNeT++-related research. The 2018 event continues to expand the idea of a yearly community summit by explicitly addressing the interaction through tutorials, panels, and coding sessions with the introduction of the Hackathon format for the first time in the history of OMNeT++-related events. The OMNeT++ hackathon provides the chance for developers of simulation models and frameworks to consult OMNeT++ core developers and fellow framework developers. We also re-introduce the possibility to submit scientific contributions which will be reviewed by the TPC and (depending on their acceptance) be published in the indexed open access journal "EPiC Series in Computing" (ISSN: 2398-7340). For the first time in the history of OMNeT++-related events, we are going to organize a "Hackathon" together with the OMNeT++ Community Summit. Migrate ANSA from INET 3.x to 4.0; make a plan to incorporate more TCP flavors (such as DCTCP, or BBR) or the IP/TCP ECN mechanism. Learn OMNeT++ best practices; get familiar with the VEINS simulator. Improve the scalability and parallelization of the OppNets framework. Improving the coexistence of the SimuLTE framework and the INET Framework, e.g. in terms of channel access. The hackathon will take place at the University of Pisa – School of Engineering main building, at the Department of Information Engineering (Dipartimento di Ingegneria dell’Informazione) located at the 2nd floor. Please follow the OMNeT++ Hackathon signs. 18:15 - 19:00 Hackathon Closure and "Best Hackathon Project Award"
19:00 - 20:00 Collective Trip to the Informal Get-Together dinner. Detailed directions will be provided on-site. The OMNeT++ Summit intends to be a lively event with a lot of discussions. A wide range of presentations and interactive sessions regarding specific topics will be held. There will be enough time to discuss about the different parts of OMNeT++ and related simulation and modeling questions. All sessions will take place at the University of Pisa - School of Engineering - Campus A - Room Aula Magna Pacinotti. jUDPWrapper: A Lightweight Approach to Access the OMNeT++/INET UDP Functionality from Java There are three methods to evaluate networked systems during the design phase: by means of simulation, a practical testbed, and mathematical analysis. In this paper, we propose the jUDPWrapper, which enables to access the OMNeT++/INET UDP functionality from Java using the Java Extensions for OMNeT++. The jUDPWrapper provides a socket-based API corresponding to the standard API defined in the java.net package. Consequently, it enables to develop application layer simulation models in Java and hereafter easily derive a Java prototype implementation. Therefore, the jUDPWrapper eases the evaluation of Java UDP applications using both simulation and practical testbed. We evaluate the jUDPWrapper using two distinct versions of OMNeT++/INET, provide the Java Extensions for OMNeT++ 5.4, and for the first time quantify the execution time of Java models versus C++ models. C++ models are approx. twice as fast as Java models in long simulation runs, if the release mode is used. Cross-layer Stack Design Framework in OMNeT++ While networking applications are getting more comprehensive, the information required to perform the algorithms running upon such applications is increasing. Even though the modular design of network stacks provides an important abstraction between layers, it is now necessary to use all layer-specific information in cooperation. Therefore, cross-layer applications are designed for years. However, implementing and testing them in network simulators are still complex. In this study, we implemented a cross-layer design onto TCP/IP stack and gave a guide to design this architecture in OMNeT++. We also investigated the design in an example use case that is a clustering algorithm for ad-hoc networks. Community-based Mobility Model and Probabilistic ORBIT Mobility Model Implementations in OMNeT++ Simulations of Opportunistic Networking (OppNet) protocols require the use of suitable synthetic mobility models or real world traces. Many synthetic mobility models have been proposed based on the study of human mobility individually and in groups. Opportunistic Protocol Simulator (OPS) is a budding simulator which is based on OMNeT++ to simulate OppNets. However, compared to other OppNet simulators in the literature, only very few synthetic mobility models exist in OMNeT++ currently, restricting the simulation of OppNets to using the existing mobility models or traces. In this paper, we develop two more synthetic mobility models in OMNeT++ namely community-based mobility model and probabilistic ORBIT based mobility, which can enhance the simulating environment available for OppNets in OMNeT++. SimuLTE-MEC: Extending SimuLTE for Multi-Access Edge Computing Multi-access Edge Computing (MEC) is a novel paradigm to enrich current 4G and future 5G cellular networks by placing cloud-computing-based capabilities at the edge of the network. This will allow operators and service providers to endow the cellular network with enriched services. In this paper we describe the modeling and development of a MEC extension for the SimuLTE framework. Simulating LISP-Based Multilink Communications in Aeronautical Networks Over the next few years, future aeronautical communications are expected to move from the OSI protocol stack to the TCP/IP one. Multiple data-link channels (e.g., satellite, terrestrial) will be available to each aircraft to communicate with ground, realizing the so-called multilink. In order to ensure a seamless handover between different data-links, the LISP protocol has been defined. This paper describes the modeling, design and implementation of LISP on the SAPIENT simulator, an OMNeT++-based simulator for aeronautical communications. It includes models of the aircrafts, including their mobility, multiple data links and ground-network elements. Migration from SERCOS III to TSN - Simulation based Comparison of TDMA and CBS Transportation The communication infrastructure of industrial plants, vehicles and many other applications must provide more and more bandwidth, sometimes with strict timing requirements for the transmission of critical data. Time-Sensitive Networking (TSN) is a set of IEEE 802 Ethernet sub-standards that meet these requirements for a wide range of applications and communication requirements. Market relevance of TSN increases in different sectors. On the other hand, SERCOS III is an established Ethernet-based communication standard, which is used in particular in the field of industrial plants. With cost and limitations of SERCOS III in mind, this paper examines the migration from SERCOS III Time Division Multiple Access (TDMA) communication on the one side to Credit Based Shaping (CBS) communication on the other side. TSN supports both mechanisms. The analyses are per-formed with OMNeT++ simulation models. Migration recommendations are derived from the comparison of TDMA- and CBS-based transportation of SERCOS III traffic. A Simulation Model of IEEE 802.1AS gPTP for Clock Synchronization in OMNeT++ The aim of this paper is to describe a developed simulation model of the gPTP protocol for time synchronization in OMNeT++ using the INET library. gPTP is part of the IEEE TSN standards. Unfortunately, there is currently no simulation model of gPTP available. Therefore, we developed a new simulation model, compared it to results from the state-of-the-art, and would like to share it with the OMNeT++ community. The simulation model is based on the IEEE 802.1AS specification for full-duplex Ethernet according to a given network topology and use case scenario to analyze the results of the simulation as well as to provide a comparison with results from the state-of-the-art. Time synchronization and propagation delay measurements between time-aware systems are considered and results show that the simulation model works as expected. Towards Evaluating Named Data Networking for the IoT: A Framework for OMNeT++ Named Data Networking is a promising architecture for emerging Internet applications such as the Internet of Things (IoT). Many studies have already investigated how NDN can be an alternative for IP in future IoT deployments. However, NDN-IoT propositions need accurate evaluation at network level and system level as well. This paper introduces an NDN framework for OMNeT++. Designed for low-end devices and gateways of the IoT, the framework is capable of simulating NDN scenarios at the boundary of the network and the system. The framework implementation is presented and used to study a typical aspect of NDN integration in IoT devices. An Integrated Framework for Fog Communications and Computing in Internet of Vehicles In this paper, the novel Fog Communications and Computing paradigm is addressed by presenting an integrated system architecture, that is applied to achieve a full context awareness for vehicular networks and, consequently, to react on traffic anomalous conditions. In particular, we propose to adopt a specific co-designed approach involving Application and Networks Layers. For the latter one, as no infrastructure usually exists, effective routing protocols are needed to guarantee a certain level of reliability of the information collected from individual vehicles. As a consequence, we investigated classical Epidemic Flooding based, Network Coding inspired and Chord protocols. Besides, we resort to Blockchain principle to design a distributed consensus sensing application. The system has been tested by resorting to OMNeT ++ framework for its modularity, high fidelity and flexibility. Performance analysis has been conducted over realistic scenarios in terms of consensus making overhead, latency and scalability, pointing out the better trade-off allowing the overlay P2P network formation and the complete context awareness achieved by the vehicles community. New Developments in OMNeT++ and INET This talk covers the current efforts to provide a Python-based result analysis within the OMNeT++ IDE. 17:15 - 18:00 Collective trip to the community dinner. Detailed directions will be provided on-site. Rare Event Analysis Using the Limited Relative Error Algorithm for OMNeT++ Simulations The Limited Relative Error algorithm is an alternative statistical method for data evaluation. Through online result analysis it continuously requests more samples until it deems the evaluation confident enough. With this it allows researchers to hand over the control of simulation time to the algorithm, and through a-priori configuration the target result resolution is set so that arbitrarily rare events can be investigated. We provide a new description of the method as well as a stand-alone implementation and an integration of the algorithm into the OMNeT++ simulator. ResourSim – Evaluating the End-user Device Usage The optimization of apps on nowadays mobile phones, tablets and smart watches is mainly done with the focus on the energy constraints, i.e., the device battery lifetime. For some applications, this is adverse to their requirements and use cases like for back-ground communication apps without direct user interaction. The framework ResourSim, as proposed in this work, aims on evaluating and optimizing the usage of device resources regarding the requirements of background tasks and the human user. This is achieved by replaying usage traces from real humans and adding arbitrary background job usage patterns. Furthermore, it is evaluated, if a statistical battery model is suitable for reflecting the real battery behavior in ResourSim. Teaching Modelling and Analysis of Communication Networks using OMNeT++ Simulator At the Hamburg University of Technology, Germany, the modelling of communication networks using the OMNeT++ simulator and the INET framework is taught for Master students. Teaching the concepts of simulation and modelling while letting the students obtain a hands-on experience during a 14-week (4h/week) period (single semester) is a challenging task. The diversity of the pre-knowledge of the participating students and the duration of the course are the main challenges that need to be addressed when organising such a course. This paper discusses the structure of this course and the best practices followed. The course adopts a methodology where lectures on concepts are mixed with INET based exercises that begin with simple topics and gradually moving into advanced topics. 11:45 - 12:00 Summit Closure Note + "Best Community Contribution" + "Best Paper Award"
Best Community Contribution 2018: Amar Abane et. al. Best Paper 2018: Sebastian Lindner et. al. 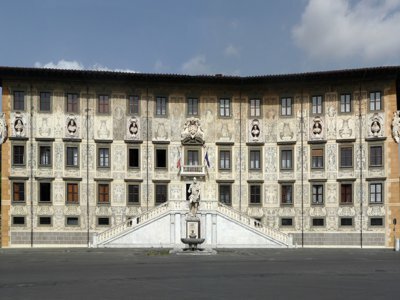 The 5th OMNeT++ Community Summit will take place at the University of Pisa in Italy. School of Engineering - University of Pisa, Largo Lucio Lazzarino, 1, 56122 Pisa. 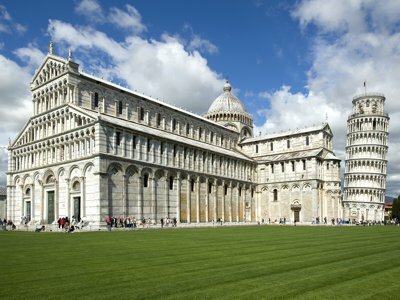 For additional hotels, please check for instance www.booking.com and search for Pisa. Pisa is a city in Tuscany, Italy, with a population of around 100.000 people. The city is located on the west coast of Italy. Well-known for its world famous Leaning Tower, the city is nowadays a student hub with the University of Pisa and its 60.000 students. 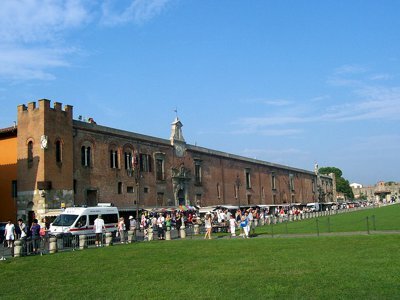 Pisa collects numerous architectural and artistic marvels throughout the city. Its four historical quarters comprises a UNESCO World Heritage site, a historic town square, and various renowned art and history museums. This airport is the international airport of the city of Pisa and the main airport of the Tuscany region in Italy. It is located just 1 km away from the city center. Various city connections are available via train, bus, or taxi. Visit the airport website for more information. This airport is located four kilometers from the center of Florence, which can be easily reached by bus. Connections to Pisa are available via train from the Florence/Firenze S.M. Novella station. The main train station in Pisa is Pisa Centrale, and it is also one of the major railway junctions of Tuscany. It is well connected with the Florence train station with multiple connections per hour. There are coach services from various European destinations that stop at Florence and partly at Pisa too. Pisa itself has bus connections to all other major Italian cities, partly to Austria, Switzerland, and South-Germany too. In case you want to contact the organizers, feel free to write an e-mail to: omnetsummit2018 [at] easychair [dot] org. The OMNeT++ Community Summit 2018 is sponsored. No registration or publication fees will apply. We would like to thank the Department of Information Engineering (Dipartimento di Ingegneria dell'Informazione) of the University of Pisa for their support in hosting the 2018 Community Summit. We would also like to thank Simulcraft Inc. for their sponsorship and support of the 2018 Community Summit.